How About a Cherry Red WallStreet? FireWire Depot Ships New FireWire 800 1394b Enclosures. The "year of the laptop" indeed. Apple's 10-Q filing this week with the Securities and Exchange Commission reveals that portable computers made up a record 46% of Apple's sales in the third quarter of 2003. Total Macintosh unit sales were down 6% during the first nine months of 2003 compared to the same period in 2002, but PowerBook unit sales were up 71% and 43% during the first three and nine months of 2003 year-over-year respectively. iBook unit sales were up 12% and 3% during the first three and nine months of 2003. MacNN has posted a good, abbreviated summary. Last March, Toshiba Corporation announced the world's first prototype of a small form factor direct methanol fuel cell (DMFC) for portable PCs, a clean energy breakthrough with the potential to end reliance on rechargeable batteries. The new fuel cell provided average output of 12W and maximum output of 20W. It can achieve approximately five hours of operation with a single cartridge of fuel. It provides instant power and achieves significant advances in operating times with replaceable methanol cartridges. The hardware capabilities of notebook PCs, cellular phones, PDAs, and other portable devices continue to make rapid progress. However, faster CPUs, higher resolution displays, wireless connectivity, and other advances all increase the demands on power supply and underline the limitations of current lithium-ion batteries. Fuel cells are widely seen as a replacement for lithium-ion batteries, but companies working on their development have to overcome the problems of miniaturization and fuel delivery. Toshiba has achieved this with its DMFC. Methanol in a fuel cell delivers power most efficiently when it is mixed with water in a 3-6% methanol concentration - a concentration requiring a fuel tank that is much too large for use with portable equipment. Toshiba overcame this by developing a system that allows a higher concentration of methanol to be diluted by the water produced as a byproduct of the power generation process. This technology allows methanol to be stored at a much higher concentration, and achieves a fuel tank less than 1/10 the size of that required for storing the same volume of methanol in a 3-6% concentration. The current prototype can operate for approximately five hours on 50cc of high concentration methanol. Alongside this, Toshiba realized essential technologies for miniaturization of a high performance fuel cell. These include interface and electric circuits to assure efficient control of power supply; sensors to monitor methanol concentration and liquid level; and a remaining quantity sensor to tell users when they need to change the methanol fuel cartridge. All these components, and low power liquid and air transmission pumps, are controlled by a super small DC-DC converter. For the cell itself, Toshiba developed a new material that allows smaller cells, allowing for miniaturization of the cell stacks. One of Toshiba's main concerns in developing the DFMC was optimized operating efficiency, to assure that the fuel cell generates power at the required level with minimal waste of energy. Towards this, the company investigated such factors as fuel density and circulation, and air supply levels, all in order to map the best operating conditions for a miniaturized fuel cell. In addition, the PC sends information on its operating status to the fuel cell in order to balance power demand and supply. Any unused energy is stored in the DMFC and can be drawn on when the PC requires extra power. Toshiba has given the DMFC the same electrodes as found in lithium-ion batteries, allowing it to connect directly to a PC or other portable device in the same way as an lithium-ion battery. It can also be used as an alternative to lithium-ion batteries. The DMFC removes the need for proximity to a mains power supply to assure long operating times. BBC News reports that NEC has also unveiled a laptop computer that has a built-in fuel cell, and within two years NEC said running times between fuel cell refills could be 40 hours or more. "The small fuel cell is powered by 300 cubic centimeters (half a pint) of methanol and uses a catalyst to break this down into oxygen and hydrogen and generates heat and power as byproducts." Consumer machines from both firms are expected to be available available in 2004. By 2006 NEC expects the fuel cell to be much more efficient and run for almost 40 hours without needing a top-up. Ars Technica Newsdesk's Fred "zAmboni" Locklear reports: "University of Wisconsin-Madison scientists have created a new catalyst which may replace the expensive platinum in hydrogen generation and with tweaking could be ripe for use in fuel cells. The Nickel/Tin/Aluminum catalyst was shown to selectively produce hydrogen and carbon dioxide from biomass materials while avoiding the production of atmospherically unfriendly methane." ResExcellence's Michael Coyle has duded up his old WallStreet PowerBook with a very classy bright red paint job. You can check out some photos at the link below. The paint job required him to to totally disassemble the PowerBook. He has posted a tutorial to guide you through the process if you would like to spruce up an old 'Book. MacMice has announced an updated version of the GPerch aluminum iPod stand at a lower price. Designed to complement the anodized, perforated aluminum styling of Apple's Power Mac G5, the GPerch is a 3" x 4" x 3.5" 5052 grade aluminum desk stand built to hold either an original or new generation iPod. This newest version is reduced in price from $39.99 to $29.99. The new GPerch iPod stand is available at the MacMice Workspace Products Co. website. MCE Technologies, LLC has begun shipping the MCE Internal 2x DVD-R/RW + DVD-RAM Drive upgrade for all PowerBook G4 models several weeks ahead of their previously announced release date. The MCE drive is the first upgrade of its kind for the PowerBook G4 to implement cartridgeless DVD-RAM technology, which stores and accesses data like a hard drive on removable 4.7 GB or 9.4 GB DVD-RAM media as the user drags-and-drops files to the DVD-RAM volume. The drive is compatible with iDVD and other popular DVD authoring applications. Prices start at $349. The MCE Internal 2x DVD-R/RW + DVD-RAM drive for the PowerBook G4 writes to standard 4.7 GB DVD-R media at up to 2x speed, to 4.7 GB single-sided or 9.4 GB double-sided DVD-RAM media at up to 2x speed, and to 4.7 GB DVD-RW media at 1x speed. In addition, it writes to standard 650 MB and 700 MB CD-R media at up to up to 16x speed, writes to standard CD-RW media at up to 8x speed, reads DVD-ROM discs at up to up to 8x speed, and reads standard CD-ROM discs at up to 24x speed. The MCE Internal 2x DVD-R/RW + DVD-RAM drive for PowerBook G4 is compatible with Apple's iDVD, iTunes, Disc Burner, and DVD Player. It also includes ImageMixer DVD Authoring software for Mac OS X and Mac OS 9, as well as Roxio Toast Lite software to facilitate faster and more efficient data DVD and CD recording. The MCE Internal 2x DVD-R/RW + DVD-RAM drive is compatible with all PowerBook G4 12", 15", and 17" computers. The suggested retail price is $349 for most PowerBook G4 models, $389 for 400 and 500 MHz PowerBook G4. Because of the delicate nature of the installation procedure, installation must take place at MCE Technologies, or at an MCE Authorized Upgrade Center. A complete list of centers is on the MCE Technologies web site. Contact MCE for complete details and product specifications. "Since October 2000 MacProf has tried to test and experiment GPS for Mac, and our first success was the pairing of Garmin external receiver and Route 66 thanks to USB-Serial adapters.
" With the first versions of Mac OS X, there was no way to make Route 66 recognize the CF GPS adapter, and we lost our hope of traveling around with our PowerBook booted from X and the device. But many recent updates of the OS have added PCMCIA cards compatibilities, and we wanted to try if it was the case also with Haico. "Booting from Mac OS X 10.2.6 with the card inserted we received a good surprise: the CF GPS receiver is seen as PC CARD Serial IO and interacts perfectly with the Mac OS X version of Route 66 showing our 2D and 3D coordinates and our direction. "A good tool for frequent and occasional travelers, owners of Route 66 and a PowerBook and trekker with a PocketPC with CF slot. "Check the Route 66 website for the latest Maps for US and Europe." You can read the full review online. MacResQ has announced a new "self-serve" user-installable PowerBook G4 "SuperDrive" upgrade. The new drive offers PowerBook G4 owners an affordable way to upgrade their G4 PowerBook with a DVD-R/CD-RW burner that is natively compatible with the Mac OS and requires no third party drives or patches to operate. "The response to our full-service PowerBook G4 'SuperDrive' upgrade has been fantastic," said Mr. Shannon Jean, President of MacResQ. "Many of our technically savvy customers have inquired about being able to purchase the 'SuperDrive' outright to install themselves, and we're pleased to now offer this service." Owners of the PowerBook G4/400-1 GHz can now easily replace their built-in CD-RW or DVD-only drive with a drive that can burn CD-RWs and DVD-Rs that can be played in most consumer CD/DVD players. The slot-loading "SuperDrive" DVD-R/CD-RW is bootable and compatible with Apple's Mac OS X, OS 9, iDVD, iTunes, Disc Burner, Finder Burning, and Apple DVD Player, as well as other third-party applications. "The compatibility issue is paramount to our customers," said Mr. Jean. "The 'SuperDrive' used in our upgrade does not require any unstable patches or drivers to operate seamlessly with the Mac OS and the iApps. The drive is completely plug and play." The price for this self-service "SuperDrive" upgrade is only $299 and includes comprehensive installation instructions and a prepaid return shipping label for the customer to return their old optical drive to MacResQ. PowerBook owners who would rather not install the drive themselves can still take advantage of MacResQ's exclusive nationwide, 24-hour turnaround installation for just $399. This full-service upgrade includes pickup at the customer's location, overnight delivery to the PowerBookResQ service center, expert installation within 24 hours, and return overnight shipping to the customer. Reuters reports that Seagate Technology, the largest U.S. maker of computer hard disk drives, is aiming to have 10 percent of the global laptop disk drive market by June next year. "Seagate said in June that it was entering the laptop-computer market, giving it a presence in all four disk drive segments." 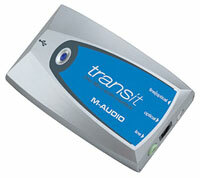 Small enough to fit in your pocket, Transit brings hi-resolution 24-bit/96 KHz recording and playback to any USB-compatible computer. Digital I/O lets you transfer pristine audio between your computer and other devices such as MiniDisc and DAT. The digital output can deliver AC3 and DTS from your computer to an external decoder such as a surround receiver. And the bus-powered design allows you play and record virtually anywhere your laptop can go. Transit is your ticket to ride. Dimensions: 2.2" x 3.6" x 0.9"
WiebeTech is now shipping its FireWire 800 version of the popular Micro GB+ pocket drives. The new version is named Micro GB800. All configurations are in stock. "We are delighted to see WiebeTech ship the first readily available pocket drive using an Oxford OXUF922 FireWire bridge," said James Lewis, President of Oxford Semiconductor. "Users will get to experience transfers from a pocket drive that are faster than any desktop or portable FireWire 400 drive that has ever shipped." Users will be able to transfer data at a rate of greater than 2.1 GB per minute when ordered with a 60 GB/7200 rpm drive. WiebeTech's internal testing shows peak transfer rates that are close to 50 MB/sec, and sustained transfer rates are approximately 38 MB/sec when using the 7200 rpm drive. All of this is achieved in an enclosure with dimensions less than 5 inches x 3 inches x .65 inches. The product features dual FireWire 800 ports and a single mini USB2 port. An AC adapter is included (although the product is bus powered in FireWire mode and with certain USB hosts). An attractive carrying case is also included. 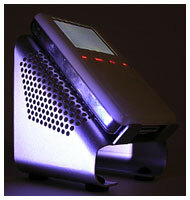 Dealers may purchase Micro GB800 from WiebeTech's distributor, Dr Bott, or from dealers. All configurations are in stock and available directly from WiebeTech. Canadian resellers may purchase products from EMJ. FireWireDirect.com, Inc., wants to welcome users to the increased performance possibilities of FireWire 800/1394b with a special new package that includes a 3-port FireWire 800 PCI Host Adapter for only $39.95. The special price is on a high performance, 3-port FireWire 800 PCI card, when purchased along with one of FireWireDirect's Ultra III 800 (FireWire 800/1394b) hard drives or enclosures. FireWire 800 offers immediate leaps in performance and speed over legacy FireWire, and requires 1394b compliant FireWire 800 ports on your personal computer. For users eager to make the leap to FireWire 800 storage but still requiring the upgrade to the faster standard, FireWire Direct is pleased to provide this combo with its low priced upgrade card to introduce the new technology. Performance benefits from FireWire 800 are immediate and obvious. FireWire 800 hard drives from FireWire Direct, connected by FireWire Direct PCI FireWire 800 cards, are seeing sustained speeds of over 50 MB/s on modern Windows computers and Macintosh (OS X) machines that support the new standard. FireWire Direct was the first company to ship a FireWire 800 card to consumers and now offers a pair of hard drive lines and a compliment of other products all compliant with the new standard. Interest in higher speed FireWire has been strong and FireWireDirect's web site contains a wealth of information about the new standard. "Digital video and audio producers, and anyone who uses external storage, has an immediate interest in doubling their speed," says Jeff Questad, FireWireDirect's Marketing Director. "The FireWire 800 buzz was substantial, and now that it's real, shipping, and the performance enhancements are seen to be concrete, users are rushing to us looking for information and new products." The bundle deal including the low priced PCI Adapter is available only on a special page in the FireWire Direct site. FireWire Depot has announced the introduction of the Concord800 dual drive and TT745-800 single drive FireWire 800 1394b enclosures. FireWire Depot was the first company to start shipping the new FireWire 800 1394b enclosures in April 2003 and continues to expand on their growing line of FireWire 800 enclosures and peripherals which include the 3.5" IceCube800 (1394b/USB2) enclosure, the 3.5" MantaRay800 (1394b/USB2), the 3.5" Speedzter3-800 (1394b/USB2), the PCI-800 host adapter card, 1394b cables,1394b stand-alone bridgeboards for converting existing SCSI enclosures into FireWire 800 1394b enclosures, and now the new 3.5" Concord800 dual drive and TT745-800 single drive enclosures. The Concord800, which will be available for shipping at the end of August, is an update to our existing Concord dual drive enclosure. The Concord800 uses the new Oxford 922 chip for FireWire 800 1394b speed. It supports two drives (Master and Slave) in the smallest dual drive enclosure available. The TT745-800, $129.99 retail, is available for immediate shipping. It also uses the new Oxford 922 chip for FireWire 800 1394b speed, and includes a USB2 port for portability and performance. The IceCube800, MantaRay800, and Speedzter3-800 enclosures also use the Oxford 922 chip and offer both FireWire 800 1394b and USB2 connectors. All Oxford 922 based enclosures will accept any IDE/ATA hard drive and are compatible with the new ATA-6 large capacity drives currently ranging in capacity up to 320 GB. FireWireDirect.com, Inc has announced the introduction of the Ultra III 800, the newest in their long established and popular Ultra Series of FireWire 3.5" desktop hard drive systems and the first in this line to employ the new, faster FireWire 800 data interface. It is the second announcement of an 800 Mbps hard drive product from FireWire Direct in as many weeks, propelling the company to a position as the early front runner in the transition to consumer FireWire "B" products. FireWire Direct was the first FireWire dedicated company when they debuted over 3 years ago, and with the release of their FireWire 800 PCI card and a series of cables became the first company to ship FireWire 800 products to consumers two months ago. FireWire 800, or 1394b, is a new, faster FireWire standard rolling out in highly anticipated new products from FireWire Direct. The improved standard offers dramatically increased speeds and enhancements that will be immediately attractive to digital video and audio producers, multimedia creators and every personal computer user demanding cost effective and speedy storage for the digital life style. FireWire Direct now offers two desktop hard drive systems capable of the new performance standards. The new Ultra III 800 employs the Oxford 922 FireWire 800 chip, and has a dual USB 2.0 and FireWire interface. It boasts a sleek, Titanium styled chassis, ships with FireWire and USB cables, installs easily with no special drivers, includes drive formatting software for both Windows and Mac, and is available and shipping now in Enclosures and a series of high performance drives up to 320 GB. The StingRay 800, another 800 Mbps FireWire drive (also with USB 2.0) was announced last week and has already become a popular seller for FireWireDirect. Both drives are providing speeds of up to an over 50 MB/s, even on modest machines, and are visible at the company's website.